Cellist Nathan Chan discovered his talent for music at an early age through conducting. Before he was 2, he could emulate the styles of conductors he saw on music videos such as Seiji Ozawa, Herbert von Karajan and Leonard Bernstein, using a chopstick as a baton. As a toddler, his imitations were so intuitively musical that he caught the attention of San Francisco Opera Assistant Conductor Sara Jobin. Under her eye, he made his debut as a conductor at age 3, leading the San Jose Chamber Orchestra in a set of Mozart variations, despite not yet being able to read music. This was followed by a guest appearance with the Palo Alto Philharmonic a year later, conducting the first movement of Beethoven’s Fifth Symphony. Initially drawn to the sounds of low strings, he began formal music lessons with cellist Irene Sharp at age 5. He later studied with Sieun Lin at the San Francisco Conservatory of Music. Nathan Chan has performed as a soloist with the San Francisco Symphony, the Royal Philharmonic, Albany Symphony, Reno Philharmonic and Hong Kong Chamber Orchestra, working with conductors such as James Gaffigan, Donato Cabrera, Alasdair Neale, Edwin Outwater, Laura Jackson and David Allen Miller, among others. He also participated in the Emmy Award-winning NPR program From the Top and NPR's Performance Today with Fred Child. In 2009 he was featured in The World’s Greatest Musical Prodigies, a three-part British series documenting a global search for talented musicians, in which Chan and three other performers gave the world premiere of the Velesslavista Quadruple Concerto, composed by Alexander Prior. Chan has performed benefit concerts for the American Alzheimer's Association and the Friends of Children with Special Needs, among others. For his contributions to the community, he won the Peninsula Arts Council’s Ray Lorenzato Diamond Arts Award in 2007. In 2006 Nathan Chan appeared in The Music in Me, a documentary that aired on HBO and won the Peabody Award. This program led to a performance in Carnegie Hall and caught the attention of the legendary soul singer Roberta Flack, who invited Chan to collaborate on her project of Beatles songs for Sony Records. Chan was named a 2012 Davidson Fellow for his project entitled, "The Importance of Passion” and was awarded a $25,000 scholarship as part of this prestigious honor. While in New York City, he made his debut in Avery Fisher Hall (now David Geffen Hall) playing Haydn's Cello Concerto in C major and with the Juilliard Orchestra performing Strauss' Don Quixote as the winner of the 2013 Juilliard Cello Concerto Competition, led by Leonard Slatkin. In 2015 Chan was chosen to participate in Classe d'Excellence du Violoncelle with world-renowned cellist Gautier Capuçon in association with Fondation Louis Vuitton in Paris, France. 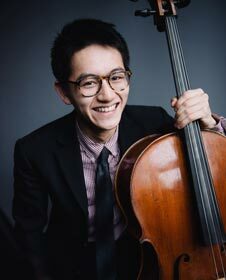 Chan won the 2015 Aspen Low Strings Concerto Competition playing Haydn’s Cello Concerto in D major and was a recipient of the 2016 Samuel Mayes Memorial Cello Award at Tanglewood. Chan is a strong proponent of using technology and media to attract others into the classical world and is committed to his fast growing Internet presence; to date, he has over 6.1 million views on YouTube. (youtube.com/nathanchancello) In 2017, he joined the Seattle Symphony as third chair cello. Nathan received his Bachelor of Arts Degree in Economics at Columbia University and his Master of Music with Richard Aaron at The Juilliard School.